If ‘A Monster Calls’, the first film I’ve seen this year, is a sign of things to come at the cinema in 2017, then we’re in for a cracking year. I must admit to being sceptical about this film despite the critical acclaim and talent both behind and in front of the camera, largely down to a lacklustre trailer and a premise that sounds a little hokey, but this is a really, really good film. That’s not to say it doesn’t have its hokey elements, particularly in the early interactions with the titular monster that fail to spark to life at the outset, but the film and the performances are good enough to overcome a slow start to develop into something approaching truly special. The film revolves around Conor O’Malley (Lewis MacDougall), a young boy coming to terms with his mother’s terminal illness whilst being bullied at school. It’s a heavy opening premise for a coming of age tale, but MacDougall’s outstanding performance and Juan Antonio Bayona’s smart direction gradually immerse you in the story and when everything clicks together it’s outstanding. At it’s heart, ‘A Monster Calls’ is a film about coming to terms with loss, and through that loss, learning to have the confidence in yourself to move on and face the future. 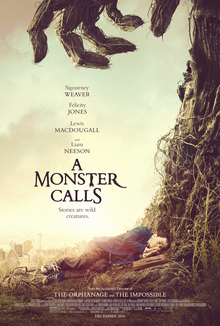 Coming of age films are one of my favourite genres and even the better films in the genre tend to follow a similar formula; ‘A Monster Calls’ is no different in that respect, but what I really enjoyed about it was the way in which it puts an original spin on this kind of storytelling. Conor is a troubled child before he has to face his mother’s illness and his primary outlet is through drawing and his imagination, and this outlet leads to the visit of a monster who appears out of the roots of a nearby yew tree, promising three stories in exchange for a fourth, a ‘truth’ told by Conor himself. The ‘monster’ is voiced by Liam Neeson and he brings a certain gravitas to the role, and whilst the initial appearance feels a little silly for lack of a better phrase, the interactions become more resonant as the film’s reality becomes more prominent in the storytelling. It helps that visually the film is an absolute treat, from the watercolour approach to the stories the monster tells, to the visualisation of the monster itself. Like the majority of films centred around a child, it wouldn’t work without getting the casting right and in Lewis MacDougall, the producers have found someone incredibly talented. His performance is heartbreaking throughout, but he raises the bar to another level with a stunning monologue that moved me to tears as the film reaches its crescendo. By this stage, the film has entered its sublime final half hour, an enchanting, moving period that delivers on the film’s promise in deeply emotional and satisfying ways. Director Bayona comes from the same school of thought as Guillermo Del Toro and I found several similarities with his masterpiece ‘Pan’s Labyrinth’, largely in how both films used fantastical elements and visual style to tell a very human story in an unorthodox way. Alongside MacDougall’s standout performance, Felicity Jones is very good as his mother and Sigourney Weaver (as Conor’s grandmother) becomes a better and more relatable character the more we get to know her. ‘A Monster Calls’ is an engrossing coming of age tale with a strong handle on the darker material underneath its fantastical approach, and I was deeply moved and sucked in by its story, and it’s a strong start to 2017!